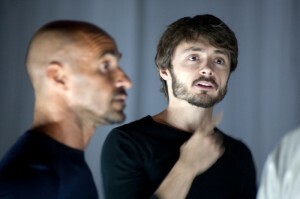 The workshop Double Skin/ Double Mind of choreographers Emio Greco and Pieter C. Scholten has since 2004 been the case study of the interdisciplinary research project Capturing Intention. This project initiated by dance company Emio Greco | PC in collaboration with the Research Group of Art Practice and Development, Amsterdam School for the Arts (Marijke Hoogenboom) focused on artistic questions around dance transmission, documentation, notation and recreation. The film documentary Double Skin/Double Mind and the interactive dvd-rom are together with a publication and an interactive installation the main outcomes of the project. For this occasion Ickamsterdam drafted the following program where the interactive dvd-rom and film documentary besides the physical workshop will provide participants with different layers of experience and understanding. Vincent graduated from the Conservatoire National Supérieur de Musique et de Danse de Paris in 1995, with a specialization in classical ballet. He danced with Ballet Victor Ullate, Ballet National de Marseille Roland Petit, Introdans, Ballets Gulbenkian and Compagnie Metros. Vincent Colomes joined Emio Greco | PC in 2006. Since 2008 he has been teaching amateur dancers the workshop Double Skin/Double Mind and since 2010 he is also teaching professional dance students. Next to that he has been involved in ICKamsterdam’s research project Inside Movement Knowledge.